Adelaide Lord Mayor Martin Haese (left) with SA Climate Change Minister Ian Hunter. 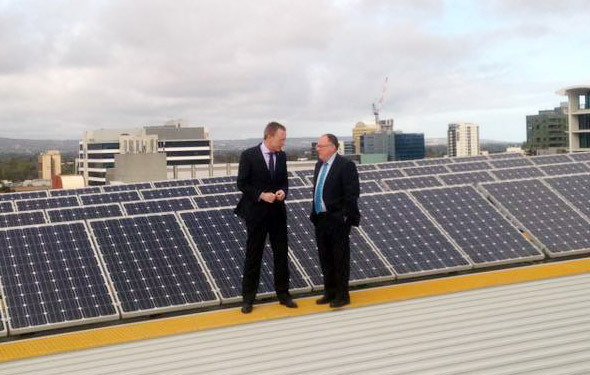 The South Australian government has announced it will match the funding Adelaide City Council is providing to residents, businesses, schools and community organisations for sustainability initiatives like solar PV, battery storage and apartment energy efficiency upgrades. The council’s funding provides direct incentives of up to $5000 for a range of sustainability initiatives, with the budget capped at $150,000. With the announcement on Monday by SA climate change minister Ian Hunter, the total funding will now be doubled to $300,000 for the 2015/16 year. “This commitment effectively doubles the opportunity for more people in the Adelaide city area to invest in technologies that reduce carbon emissions and energy use,” Mr Hunter said. “The State Government has a goal for the city of Adelaide to be carbon neutral, and this ambitious target will require a change in the way the city operates and is used. The move follows the council and state government both signing international agreements on tackling climate change in April. Adelaide Lord Mayor Martin Haese said the collaboration between council and the government to reduce greenhouse gas emissions was supported by the community, industry and business. “We have already seen this through the sheer number of enquiries we have received since our announcement,” he said. Go Adelaide and South Australia! Leading the way in Australia, and one day the world.